Jeff's Family Adventure Files: Could a Little "Me Time" Bless Your Family? Could a Little "Me Time" Bless Your Family? 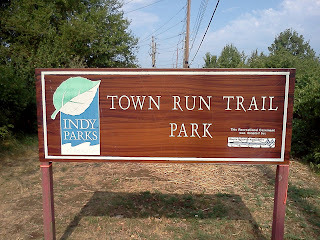 The trail in Indianapolis follows the White River! Here's something I learned this weekend about "me time": If done well, it can be a blessing to your family, instead of a burden, withdrawal, or escape. Saturday morning, I was stir crazy in a big way! Recent record heat, cancelled camping trips, and a work week on site at a clients, in which I had to be on my best behavior (and best clothes), had me all out of sorts, even on a weekend. Thinking about this, it occurred to me that I've been wanting to do some real mountain biking. Darling Bride and I discussed it, then I drove across town to a mountain bike trail maintained by Indianapolis Parks & Recreation and the Hoosier Mountain Bike Association. 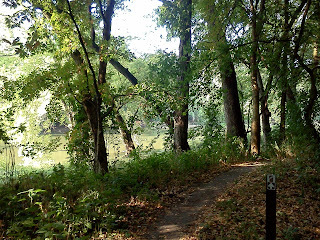 For a little over an hour, it was just me, my Trek, the White River, and a trail full of twists, turns, and hills. I came back home refreshed, inspired, motivated, and exercised! As a result, I couldn't wait to re-engage. After my ride, I was excited about the rest of the weekend. We ran some errands, grilled some food, watched Batman on TV, went to church, and went to a newlywed couple's open house. Tomorrow it is back to work at the clients. It will be hard, but at least I'm ready to try. Communicate your intentions with your better half. Hopefully get a consensus. If there is a problem here, you may have to postpone your activity and work through some things. Schedule a favorable time that makes only minimal disruption in your family's schedule. Are you pro-actively scheduling appointments with yourself? How is it working out for you - both guys and ladies? If you like, share in the comments. "Come to me, all who labor and are heavy laden, and I will give you rest. Take my yoke upon you, and learn from me..."
Hooray for you and us! I am so glad you went.